Since 1996, Amanda and the team have trained the following horses to win or be placed in the following Group 3 races. Indian Lodge (1st) in the Weatherbys Earl Of Sefton Stakes at Newmarket ridden by Mick Kinane and owned by S Cohn and Sir Eric Parker. Solo Mio (1st) in the HBLB Sagaro Stakes at Nemarket ridden by Mick Kinane and owned by Cheveley Park Stud. Tungsten Strike (1st) in the Woodcote Stud Sagaro Stakes at Ascot ridden by Darryll Holland and owned by John Connolly. Solo Mio (1st) in the Bonusprint Stakes at Sandown ridden by Mick Kinane and owned by Cheveley Park Stud. Polar Way (1st) in the AON Macdonagh Boland Stakes at the Curragh, Ireland ridden by Johnny Murtagh and owned by K Abdullah. 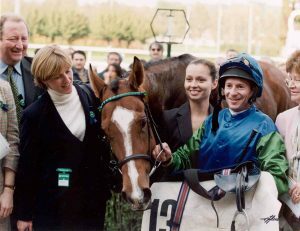 Welsh Diva (1st) in the Premio Sergio Cumani at San Siro Racecourse, Milan ridden by Richard Quinn and owned by Usk Valley Stud. Tillerman (1st) in the Michael Page International Silver Trophy at Ascot ridden by Richard Hughes and owned by K Abdullah. Tillerman (1st) in the Tom Fruit Leicestershire Stakes at Leicester ridden by Richard Hughes and owned by K Abdullah. Carnival Dancer (1st) in the Prix de La Coupe at Longchamp, France ridden by Olivier Peslier and owned by Cheveley Park Stud. Carnival Dancer (1st) in the Prix Gontaut-Biron at Deauville ridden by Olivier Peslier and owned by Cheveley Park Stud. Astronereus (1st) in the Al Rayyan Aston Park Stakes at Newbury ridden by Pat Dobbs owned by John Connolly and Odile Griffith. Weightless (1st) in the Betfred Gordon Richards Stakes at Sandown ridden by Johnny Murtagh owned by M Murphy. Demophilos (2nd) in the Peugeot Gordon Stakes at Goodwood ridden by Jamie Spencer and owned by Athos Christodoulou. Carnival Dancer (2nd) in the Meld Stakes at Leopardstown ridden by Kieren Fallon and owned by Cheveley Park Stud. Tungsten Strike (2nd) in the Hesmonds Stud Sagaro Stakes at Lingfield ridden by Ryan Moore and owned by John Connolly. Tungsten Strike (2nd) in the Jockey Club Cup at Newmarket ridden by Mick Kinane and owned by John Connolly. Tillerman (4th) in the Stan James Hungerford Stakes at Newbury ridden by Richard Hughes and owned by K Abdullah. Bangalore (4th) in the Weatherbys Insurance Lonsdale Stakes at York ridden by Richard Quinn and owned by Mike Dawson. Tungsten Strike (4th) in the Qatar Prix Gladiateur at Longchamp, France ridden by Jim Crowley and owned by John Connolly. Royal Storm (4th) Criterion Stakes at Newmarket ridden by Jimmy Fortune and owned by Mrs H Brain. Weightless (4th) in the Prix de La Coupe at Longchamp, France ridden by Jim Crowley and owned by M Murphy.